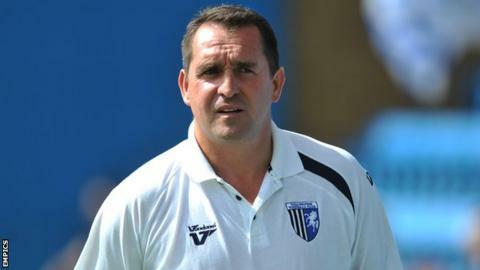 Gillingham manager Martin Allen says he will not add to his squad again before the January transfer window opens. Allen has brought in nine senior players since taking charge at Priestfield this summer. He told BBC Radio Kent: "There will be no more players coming in. We will review it in January. "Between now and January we will continue to go out and watch matches, find players and analyse our individuals within our current team." He added: "We'll look at where we need to improve and what we need to do to get better. "That will all take place over the next three months. "Come January, I will go and knock on [chairman] Paul Scally's door and hopefully he might be generous and improve our XI again. Allen says his transfer budget has been boosted by funds from deals for a trio of ex-Gillingham players. Goalkeeper Paulo Gazzaniga was sold to Southampton this summer while the League Two club have received a sell-on fee from winger Matt Jarvis's move from Wolves to West Ham and money after Chelsea left-back Ryan Bertrand appeared for England. "The goalposts have moved," Allen said. "Over the past month or two the club have picked up a lot of money. "It's like a cash machine coming in every time these players go off and play. "It's changed since I joined. The chairman's increased the budget and made offers to other players which never materialised. "He's not mad. He won't go out and spend crazy money, but I've re-iterated to him the areas I wanted to strengthen and new players have been brought in on the back of that money. "The budget has been increased."